"As part of a campaign to promote its new Elle Macpherson Intimates lingerie, Bendon stencilled slogans on pavements and roads in Wellington, Christchurch, Auckland and Dunedin. One Wellington slogan read: "I was in love with a girl once who had breasts on her back ..." followed by a web address. But the publicity stunt displeased Wellington and Christchurch city councils, which said the advertisements breached local bylaws and had to be removed." 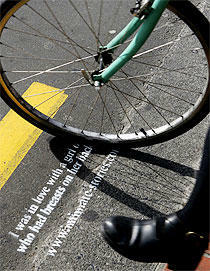 Here are some more pavement ads from years ago brought together by AdLand.